Ethical and sustainable fashion is no longer sidelined as just for ‘hippies’. In fact, it’s emerging as a cutting edge and popular fashion niche, with fashion houses like Vivienne Westwood and Stella McCarthy endorsing the movement and a host of superstars launching ethical fashion collaborations. From Emma Watson’s work with People Tree to Ben Affleck’s collaboration with Toms, and most recently Pharrell Williams’ denim range with G-Star – RAW for the Oceans – that is made from recycled plastic taken from the sea, ethical fashion is becoming increasingly trendy. Consumers are also becoming more concerned about the provenance of fashion, especially since the collapse of Rana Plaza in Dhaka, Bangladesh in April 2013, the deadliest garment industry accident in human history. Customers are looking for clothing that carries a better message – opening up an opportunity for exciting and independent start-up brands that are ethical or sustainable. A number of leading retailers are beginning to catch on to the trend – like H&M’s conscious range and Urban Outfitters Renewal – but there is still plenty of room for new brands to make a name for themselves, especially now that a number of other retailers, such as Topshop and ASOS, are stocking designer’s labels under new ethical lines. So, if you’re a budding fashion entrepreneur that is yearning to break into this billion pound and highly competitive industry, an ethical fashion brand could be your way of standing out – for all the right reasons. According to Mintel’s UK consumer trends report for 2015, both the ethical treatment of workers and environmental implications were two of the top concerns for customers when considering shopping with a particular brand. Three-quarters (76%) of UK adults affirmed that they pay attention to the ethical and green credentials of their products (including manufacturing and distribution processes) as well as the reputation of companies or brands. Big retailers are reacting to this, with fashion houses like Topshop, Marks & Spencer and ASOS getting behind ethical and sustainable brands – indicating both a growing market and an opportunity for you to potentially get your fashion line into a high street store. Topshop now has a range of UK-based designers and sustainable brands including prominent ethical fashion activist Katharine Hamnett; Marks & Spencer has a platform for its UK made brands titled Best of British; and ASOS’s Green Room is a section dedicated to ethical fashion and eco-friendly brands. In addition to this increasing consumer and retailer demand, there are also a number of different organisations dedicated to helping new designers launch an ethical fashion brand. Not for profit platform Ecoluxe London is devoted to supporting ethical clothing brands from help with product and business development to market strategies and hosting exhibitions. It also works through government incentives Growth Accelerator and Skillset to provide sustainable and ethical fashion brands with training and advice on where to get funding. UK-based but globally recognisable is the Ethical Fashion Forum, which supports businesses within the sustainable fashion industry through its SOURCE database and offers information on brand leaders, market and sales reports, and supply chain innovation. The organisation also has a directory that contains key stockists, material suppliers and manufacturers; and SOURCE runs a network that allows new companies to connect with ethical fashion brands all over the world. The London College of Fashion (LCF) established the Centre for Sustainable Fashion (CSF) to bring change to the fashion industry, and also to provide support to start-up ethical fashion brands, including workshops, one-to-one business mentoring, and courses in designing for sustainability and growth strategies. It also runs the FIREup project – which focuses on developing collaborations between University of Art London and ethical fashion start-ups. Furthermore, LCF help promote ethical fashion at London Fashion Week with Estethica, where each season the group showcase eco-friendly and ethical fashion companies. Fashion start-ups looking to get into the industry will have to consider all the usual requirements when starting a fashion brand (more information can be found in our guide to starting a clothing line). However, an ethical and sustainable brand will have to pay extra attention to where they manufacture, and what type of fabrics they use. Because of this, research is essential, as well as reaching out to the above organisations. An opportunity for start-ups launching on a budget is to use recycled and reclaimed materials, meaning you can use materials such a human made fibres like polyester without the eco-headache. One ethical fashion brand, French-based Ambrym, uses overstock from Parisian couture houses to create their line of eco-friendly clothing. And with the UK throwing away one million tonnes of clothing every year – 50% of which is reusable according to Waste Online – you’ll have plenty of material to choose from when making your first clothing line. In the past, ethical fashion has remained fairly premium – and this is where the most successful ethical fashion brands are to-date. However, it is becoming more feasible to launch a mid-market brand, depending on the cost of materials and your production (you’ll need to consider your margins). The most important thing, according to industry reports, is the quality of your designs and the manufacturing of your brand. Manufacturing in Britain is increasingly popular for ethical brands as it allows you to monitor quality control while also ensuring your brand remains ethical. 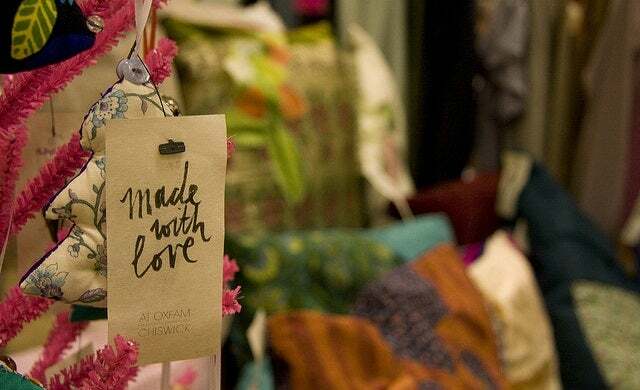 Hackney based Oh My Love London insists upon sustainability, British manufacturing and working closely with factories to ensure ethical practices but its prices match high street retailers such as River Island and Topshop. Since launch it has grown from market stalls to being stocked by brands ASOS, Nasty Gal, Nordstrom and Urban Outfitters. Other companies choose to outsource in developing countries but ensure that the workers are being paid a fair living wage and work in proper conditions, this will require extensive research and a close working relationship with the factory. Ethical fashion company annie greenabelle strictly uses factories that comply with the Ethical Trading Initiative – an alliance of companies, voluntaries and trade unions – that is working towards bringing equality to workers everywhere. For more information on the initiative and what factories it works with, have a look at its website here. Who else has started an ethical fashion brand? Wool and the Gang was set up with a mission to produce sustainable fashion and to make knitting cool. The ethical fashion company produce hand knitted clothing as well as ‘how to’ knitting kits, sourcing materials with minimal environmental impact. The company, which launched in 2012, exports globally and is present in leading retailers including John Lewis. Lexie Sport, which featured in our list of great product ideas, launched in 2013 after Innocent Smoothies’ Richard Reed spotted its growth potential and invested in the young brand. Since then the sustainable sportswear start-up has grown rapidly, owing much of this to its decision to keep the entire manufacturing process in the UK. “I think ethical fashion means something different in 2015. Gone are the days when it solely meant natural, hippy dyed fibres and a narrow design aesthetic. “We consider ourselves to be an ethical company. Our products are made here in Britain, as are the majority of our fabrics (currently one is sourced from Europe) and we are able to keep a keen eye on every stage of the production. “Disasters abroad such as the Pakistan factory collapse highlighted to many the appalling conditions some workers are forced into and this has really become a mainstream issue. Many of our customers take a strong interest in our manufacturing process. So much so that we’ve actually launched a ‘Made in Britain’ slogan vest, our ethical practices have become part of the brand DNA! “It’s important for us to put good into the world and I think with the glut of quick fashion brands that appear and then disappear equally as quickly having a substance can separate you from the pack and allow consumers to really resonate with the brand.